As the word intersectionality falls from the lips of Hillary Clinton and increasingly is normalized and sanitized, we should be clear about its radical moorings. In fact, the idea did not begin in the academy but in struggle. Last year marked the 40th anniversary of the Combahee River Collective, a Radical Black Lesbian Collective. The concepts of “simultaneity” and “intersectional feminism” capture Combahee’s grounding in the radical Black feminist tradition. As Barbara Smith, one of the co-founders of the Collective pointed out (pdf), “simultaneity” is the signature contribution of Black feminism. That is, race, class, gender, sexuality are in play at the same time. They intersect. They operate simultaneously. The queer Black feminist insurgency of the #blacklivesmatter movement today draws heavily on the Collective’s contribution. The idea of resistance to capitalism, patriarchy, and white supremacy informs the insurgency of the women of Black Lives Matter – queer, cis, trans. As the Black dispossessed struggle today with “what it means to get free,” centering gender in the fight for liberation is still neither a given nor a simple matter. Intersectional feminism, of course, speaks to the erasure of Black women in this struggle, and it also speaks directly to the complicated interrelated systems of gender, race, and class for all women in this era of #MeToo. Radical Black feminism critiques a Western feminist analysis which is Eurocentric and focuses narrowly on white, middle class, elite women in the U.S. and elite women globally. This is a combination of radical theory and practice, the pillar upon which intersectional feminism builds resistance to domestic and state violence. This is violence leveled against the tens of hundreds of thousands of Black women in the U.S. and globally. So this new generation of radical Black feminists are lifting up another hashtag #SayHerName, catalyzed by the African American Policy Forum. The Forum is directed by Kimberle Crenshaw who is often credited with coining the term intersectionality. In view of unnamed Black women killed by the police, #SayHerName demands that we know the name of Black women victims such as Korryn Gaines who was shot with her 5-year-old daughter in her harms. 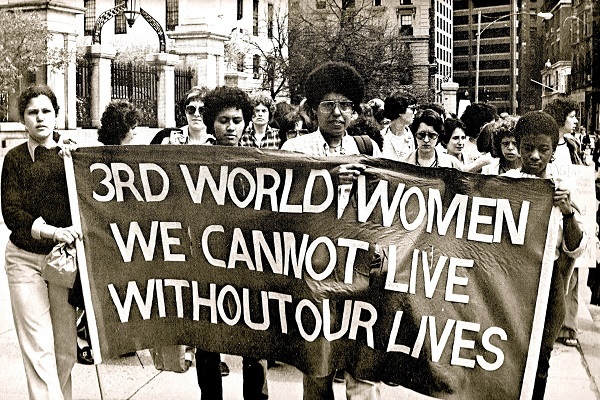 Forty years ago The Combahee Collective stood firm in demanding struggle around the 13 Black women murdered with their deaths not pursued by those in charge in Boston. We’ve come full circle as another generation of radical Black women, deeply intersectional in their practice, demand that we #SayHerName. Radical Black feminists understand the imperative of the dispossessed in the center of the empire, as well as the world’s people, coming together to articulate and practice the transformation of patriarchal, white supremacist capitalism. This struggle must be at the core of our theory and practice. In the movement for social transformation we simply cannot articulate race, class, gender in reductionist terms but must move with a critical understanding of the deep interrelationality of social forces for fundamental social change. This articulation is at the heart of the radical praxis of Black feminism.